Qualcomm today announced “Vision Intelligence” Platform which includes a pair of new 10nm FinFET SoCs; QCS605 and QCS603 SoCs that are mainly designed for camera-equipped IoT home and industrial gadgets. The new SoCs integrate Qualcomm’s advanced image signal processor (ISP) and Qualcomm Artificial Intelligence (AI) Engine, ARM-based multicore CPU; eight Qualcomm Kryo 360 CPU cores, Hexagon 685 Vector Processor, and Adreno 615 GPU. It also includes Qualcomm’s advanced camera processing software, machine learning and computer vision software development kits (SDKs), connectivity and security technologies. The company says that the platform is optimized to support industrial and consumer smart security cameras, sports cameras, wearable cameras, virtual reality (VR) 360 and 180 cameras, robotics, smart displays, and more. It also said that KEDACOM and Ricoh THETA are planning to bring products based on the Qualcomm Vision Intelligence Platform. The Vision Intelligence Platform supports up to 4K video resolution at 60 frames per second (fps), or 5.7K at 30 fps. It features a dual 14-bit Qualcomm Spectra 270 ISP that supports dual 16 megapixels sensors. Additionally, the Vision Intelligence Platform includes advanced vision processing capabilities that are necessary for IoT segments such as staggered HDR, advanced electronic image stabilization, de-warp, de-noise, chromatic aberration correction, and motion compensated temporal filters in hardware. Additionally, they also have support for 2×2 802.11ac Wi-Fi with MU-MIMO and dual-band simultaneous transmission, Bluetooth 5.1, 3D Audio Suite, Aqstic Audio Technologies and aptX Audio. Currently, the Qualcomm QCS605 and QCS603 SoCs are sampling with multiple SKUs that are designed to meet a variety of technical and cost-effectiveness requirements. The QCS605-based VR 360 camera’s reference designs from Qualcomm Technologies and Altek Corporation are available today, and QCS603-based industrial security camera reference will be available in the second half of 2018. Our goal is to make IoT devices significantly smarter as we help customers bring powerful on-device intelligence, camera processing and security. AI is already enabling cameras with object detection, tracking, classification and facial recognition, robots that avoid obstacles autonomously, and action cameras that learn and generate a video summary of your latest adventure, but this is really just the beginning. 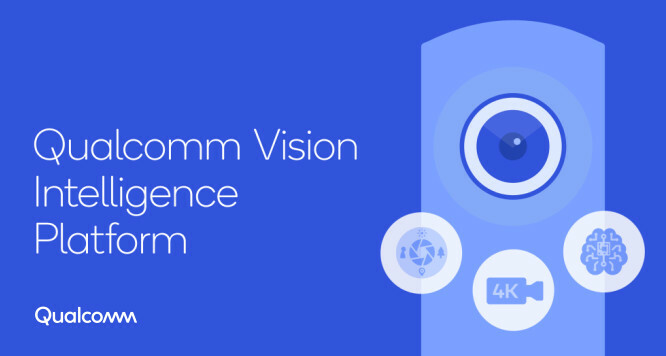 The Qualcomm Vision Intelligence Platform is the culmination of years of advanced research and development that brings together breakthrough advancements in camera, on-device AI and heterogeneous computing. The platform is a premier launchpad for manufacturers and developers to create a new world of intelligent IoT devices.